Liczba stron: 285 Jest to ujednolicona liczba stron, która ułatwi Ci porównanie długości książek. Każda strona Legimi to 200 słów. 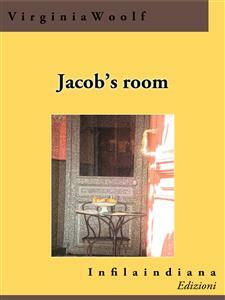 The novel, first published in 1922, is centered around the life story of Jacob Flanders, the protagonist, and is told mainly through the perspectives of the woman in Jabob’s life. With its experimental forms and style, is an important modernist text.Virginia Woolf (1882 - 1941) was born in London and is considered a modernist writer and one of the pioner in the use of stream of consciousness. Her fist novel The voyage Out was publiched in 1915. Mrs Dalloway (1925) is another Woolf’s famouse novel. a cura di Infilaindiana Edizioni. The novel, first published in 1922, is centered around the life story of Jacob Flanders, the protagonist, and is told mainly through the perspectives of the woman in Jabob’s life. With its experimental forms and style, is an important modernist text. Virginia Woolf (1882 - 1941) was born in London and is considered a modernist writer and one of the pioner in the use of stream of consciousness. Her fist novel The voyage Out was publiched in 1915. Mrs Dalloway (1925) is another Woolf’s famouse novel. the lighthouse was upright; but the blot had spread. “… nothing for it but to leave,” she read. to play” – what a horrid blot! It must be getting late. the rector’s wife, think at church, while the hymn-tune played and Mrs.
creatures. Mrs. Flanders had been a widow for these two years. gratified if his landladies liked his pictures – which they often did. at the dark little coils on his palette. “Ja–cob! Ja–cob!” shouted Archer, lagging on after a second. against rocks – so it sounded. looked and saw to his horror a cloud over the bay. off, and picked up her black parasol. heroic, before he gets to the top. skirted the incoming waves, and settled near their boots. was sitting on the sand. He ran towards her. seaweed which pops when it is pressed. He was lost. skull – perhaps a cow’s skull, a skull, perhaps, with the teeth in it. held the skull in his arms. the whole space of the beach in a few seconds. “What has he got hold of? up the sheep’s jaw, which was loose. time in the depths of her mind of some buried discomfort. stirred Betty Flanders and made her think of responsibility and danger. She gripped Archer’s hand. On she plodded up the hill. “What did I ask you to remember?” she said. “I don’t know,” said Archer. respects every woman is nicer than any man? “The meat!” she exclaimed, striking the latch down. lit up a child’s bucket and a purple aster and reached the hedge. Mrs.
persistently, upon the glass. There was a hurricane out at sea. and streaming down the windows. “What’s all that water rushing in?” murmured Archer. “It’s only the bath water running away,” said Mrs. Flanders. “I say, won’t that steamer sink?” said Archer, opening his eyes. window shook, and Rebecca stole like a cat and wedged it. sudden wrench at the cheap fastenings. crossed over to the cot. “Asleep?” whispered Rebecca, looking at the cot. her spectacles, her sewing; and a letter with the Scarborough postmark. She had not drawn the curtains either. the Atlantic, jerking the stars above the ships this way and that. something yellow-tinted and sulphurous in the darkness. silver streak showed in the looking-glass. feet. He had kicked it against the iron bed-rail. for no reason that any one could see perhaps three times a day. were raised higher than usual; wives tugged their husbands’ arms. wild – well, she had to call him something. An example for the boys. funeral, that was Seabrook’s voice – the voice of the dead. she went to feed the fowls. “Wouldn’t you like my knife, mother?” said Archer. “What a big knife for a small boy!” she said. She took it to please him. Mrs. Flanders was in the orchard with the chickens. like old George Garfit, leaning over his garden gate smoking his pipe. against it to be judged. “Now she’s going up the hill with little John,” said Mrs. Cranch to Mrs.
stout, sat down in the fortress and looked about her. bonnets fringed soft, pink, querulous faces on pillows in bath chairs. with three differently coloured notes of exclamation. on the lower pier taking up their pitch within its range. The band played in the Moorish kiosk. Number nine went up on the board. swaying round the iron pillars of the pier. arrow-heads; Roman glass and a forceps green with verdigris. The Rev. And now, what’s the next thing to see in Scarborough? or when some insect dashed at her, boomed in her ear, and was gone. unexpectedly, and they all began to walk slowly home. “Who is that?” said Mrs. Flanders, shading her eyes. “That old man in the road?” said Archer, looking below. – as he could fit it in – for the parish was a very large one, and Mr.
was that very evening when she came back from having tea with old Mrs.
was not about the boys. across the lawn with Johnny behind them, brandishing a stick. Mrs. Flanders flushed with anger. his stick away from him. “But they’d escaped!” he cried, struggling to get free. herded the geese back into the orchard. much younger than she was, but what a nice man – and such a scholar too. was in the hall. “I am much surprised…” she wrote. Mr. Floyd did not like to stop him in the street. the neck behind the ears. did not like red hair in men. Smiling, she went into the kitchen. The stag-beetle dies slowly (it was John who collected the beetles). a broiling sun. A fritillary basked on a white stone in the Roman camp. clouded yellows in the clover field, eight miles from home. Rebecca had caught the death’s-head moth in the kitchen. A strong smell of camphor came from the butterfly boxes. Mixed with the smell of camphor was the unmistakable smell of seaweed. Tawny ribbons hung on the door. The sun beat straight upon them. had been a volley of pistol-shots suddenly in the depths of the wood. only one of her sons who never obeyed her, she said. fine pen, made a correction in the margin.